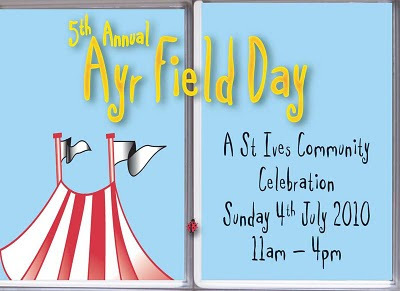 Another Ayr Field Day is almost upon us - this Sunday (4th July) from 11.00 am to 4.00 pm - fun for everybody and completely free. I've decided to add a new page to this blog. The link is in the sidebar (top right) if you want to take a look. Your ad includes up to sixty words of text, your phone number, email address and a link to your website if you have one. The cost is just £4.00 for a month or £40 for a year. Then simply use the donate button on the right to pay with your PayPal account, credit or debit card (note you don't have to have a PayPal account yourself to use it). Or you can pay me in cash. Anybody who commissions me to work on a website will get a free ad for a month. Existing clients can also have a free month if they wish - let me know. If you would like a larger more prominent ad contact me to discuss. I've added the same feature to my OneStIves website. 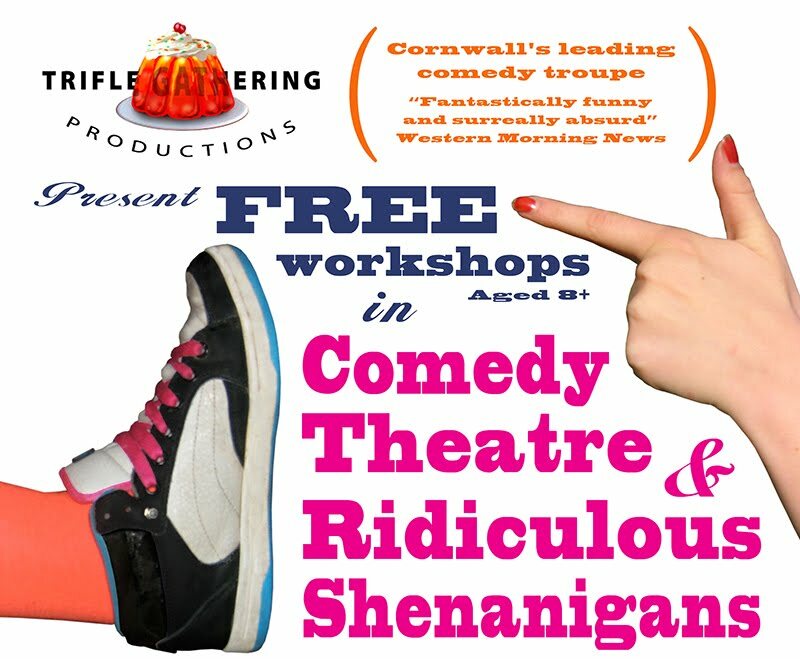 Theatre company Trifle Gathering Productions and Ayr Field Community Group have organised two free Street Theatre Workshops. These are on Thursday 1st and Friday 2nd July, 3.15 pm - 5.45 pm at St Ives School. 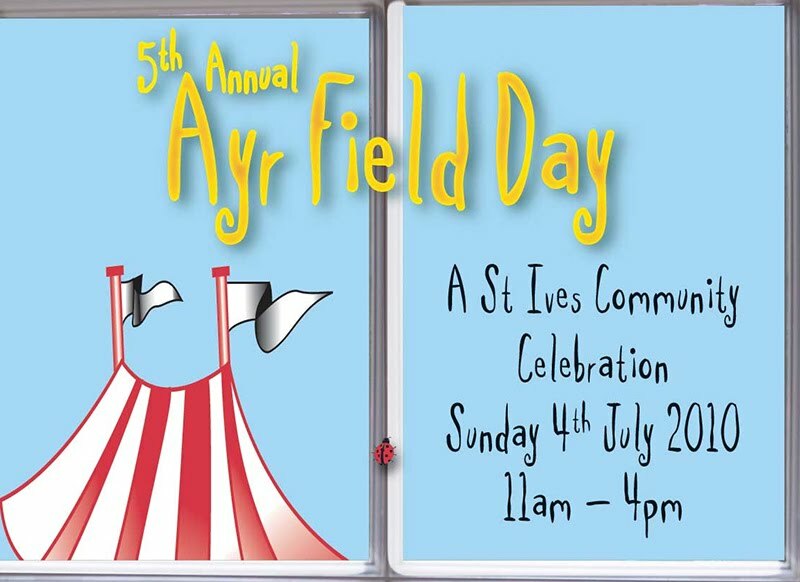 They lead to a short performance at Ayr Field Day on Sunday 4th July. Suitable for ages 8+ - all welcome. Not feeling yourself ? Great ! Then explore and create an exciting character. Kyla Goody and Sarah Crooks will guide you on your quest with improvised games and activities. For more information contact Rissa at fiveinafield@aol.com or phone 07727 210 324. 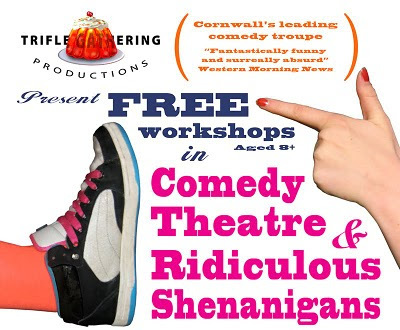 Trifle Gathering are Cornwall's leading exponents of delirious wit — bringing highly original comedy and theatre to anyone in need of a hearty chuckle. They produce cabaret, events and theatre shows for absolutely everyone. It's more than a serving of cold pud ! I'm also working on FaceBook pages for other local businesses including Fine Art Print Centre, artist Keith English and my wife - textile artist Jo McIntosh. Due to go live soon. 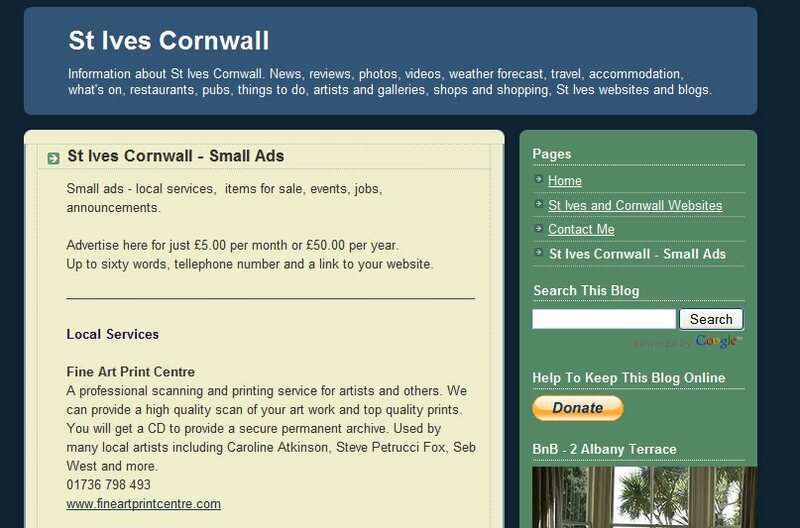 I'll also be adding pages for my own St Ives Website Development business and my OneStIves site. St Ives Arts Club are using theirs to list events such as exhibitions and live music. Also to generally promote the club. St Ives September Festival are doing something similar. They also have an events list and post the latest festival news on their page. Local Children's author Liz Kessler has a wonderful page, which she uses to keep her young readers updated on the latest books. She also answers comments a queries from her readers. 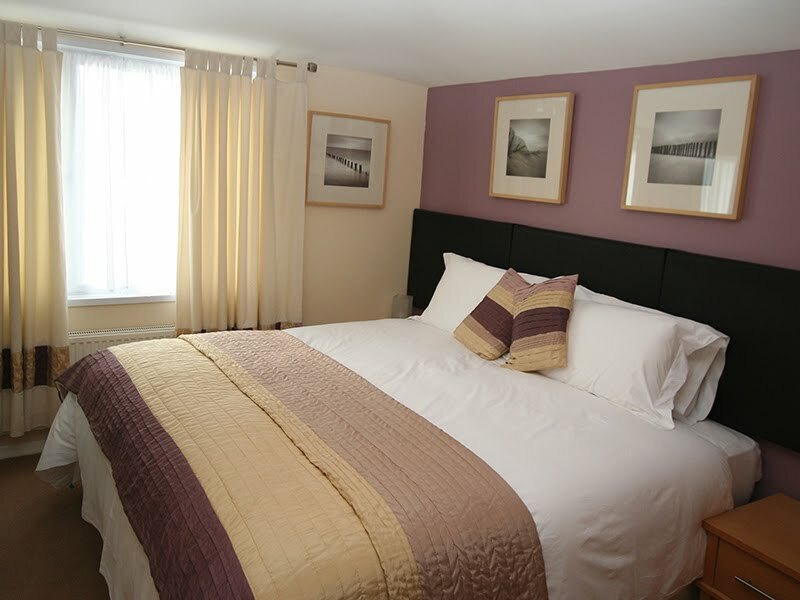 Among the businesses listed is The Sail Lofts with details of their self catering apartments close to Porthmeor Beach. There are many more - feel free to post others of interest in the Comments. If you'd like help setting up your own FaceBook page get in touch. 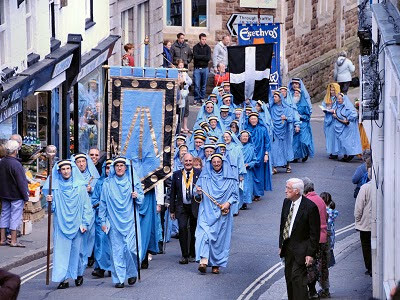 The Annual Gorsedh, the full ceremonial Assembly of the Bards of Cornwall, will take place on the Island at St Ives on Saturday 4th September 2010 starting at 2.00 pm. It is an annual celebration of Cornish traditions and culture. All are welcome to attend, free of charge. It will include the Procession and Assembly of some 300 robed Bards and local representatives, initiation of new Bards, presentation of awards and prizes, formal presentation of a ceremonial sheaf of herbs and flowers by The Lady of Cornwall and a Flower Dance by children. A Concert, for which a small charge is made, will be held at St Ives Guildhall at 7.00 pm that evening. An ecumenical church service in Cornish is held on Sunday afternoon at St Ives Parish Church at 3.00pm, and again public attendance is welcomed. Gorsedh Berdh Kernow, the Gorsedd of the Bards of Cornwall was inaugurated at the ancient stone circle at Boscawen-Un in the parish of St Buryan on 21st September 1928 by Archdruid Pedrog of Wales. Although independent, it is allied to those of Wales and Brittany. The Gorsedh is non-political, not affiliated to any religion, non-profit making and has no connection with Druidism or any pagan practices. It exists to maintain and express the national Celtic spirit of Cornwall, to encourage the study of Cornish history and the Cornish language, and to foster Cornish literature, art and music. Also to link Cornwall with other Celtic countries and to promote a spirit of peace and co-operation among those who work for the good and honour of Cornwall. Each Open Gorsedh begins with the sounding of the Horn of the Nation to the four points of the compass. A symbolic call to all Cornwall. After the ceremony of Peace the Gorsedh is formally declared to be open. The offering of flowers and fruits of the earth is symbolic of God’s gifts to mankind. The event is formally closed after a repetition of the Ceremony of Peace. 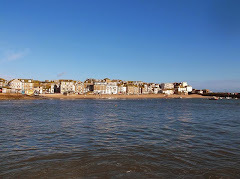 Looks like another sunny week ahead in St Ives and as ever lots to see and do. Tonight (Friday 18th) the heats of Battle Of The Bands are at St Ives Rugby Club starting at 7.30 pm. The winning bands will get a gig at The Guildhall during the September Festival on Monday 13th September. Tomorrow (Saturday 19th) there is a Cornish Producers Market at The Guildhall, part of the St Ives Food and Drink Festival (also open on Sunday). There are also cookery demonstrations on The West Pier throughout the day. Local guide Valerie Hurry is running a special guided tour with a festival theme - meet outside The Guildhall at 2.00 pm. On Sunday (20th) you might check out the preview of the new St Ives Arts Club exhibition - Collective Artistica. Starts at 6.00 pm, you can meet the artists and enjoy music, snacks and drinks. On Monday (21st) St Ives School Of Painting have a life drawing class starting at 7.30 pm. You can just turn up, no need to book, beginners welcome and cost is £7.00. On Tuesday (22nd) St Ives Jazz Club celebrate their 12th anniversary with a Gala Night. Three bands, special guests and a buffet. Tickets are £10.00 / £6.00 (members). Doors open at 8.00 pm with music from 9.00 pm. Advance booking is advised, call 01736 798 061 or 01736 796 082. 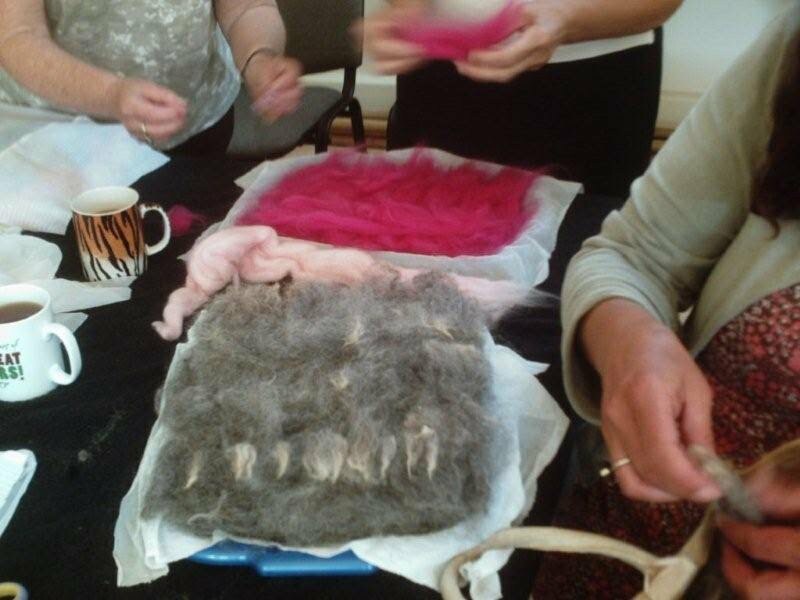 On Wednesday (23rd) Jo McIntosh is running a Feltmaking Workshop. It runs from 10.00 am to 4.00 pm and costs £40.00, you need to book in advance. There are still a couple of places left so contact Jo to book - 01736 797 122. 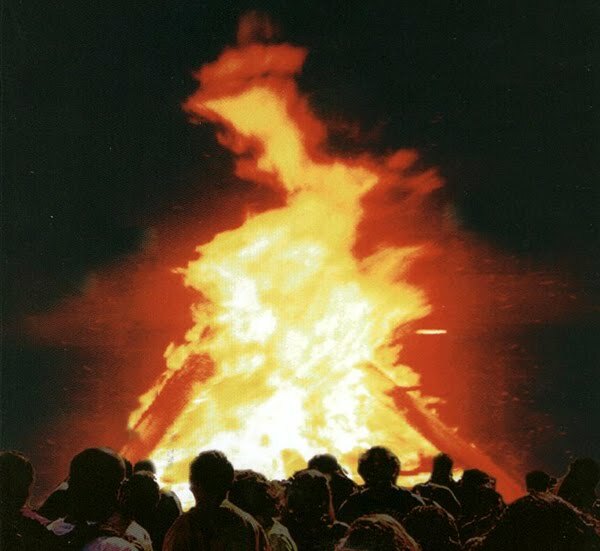 Also on Wednesday St Ives Old Cornwall Society have a Midsummer Bonfire at Carn Stabba near Halsetown, free parking at The Halsetown Inn. The fire will be lit at 9.45 pm. Music from local band Bagas Porthia. On Thursday (24th) Soggy The Bear returns to St Ives Theatre with a new production for children - where he meets a Mermaid and helps a Sea Captain find a Golden Treasure. Performances at 10.30 am and 12.00 pm. Tickets cost £5.00 and are available from the theatre box office - 01736 797 007. The latest in the St Ives Arts Club World Music Concerts programme is this Friday (18th June) at 7.30 pm, doors open at 7.00 pm. Music Of Iran - Farshad Mohammadi. 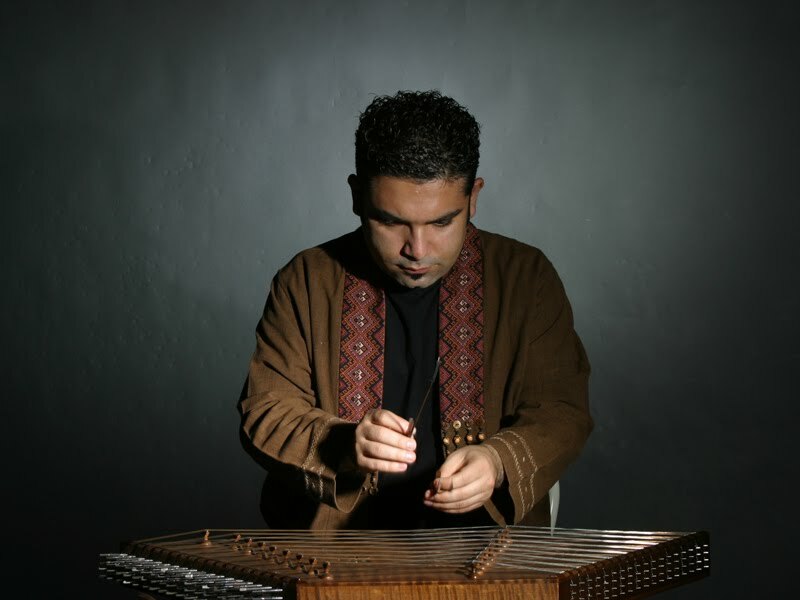 Farshad will be playing solo music for santoor, a hammered zither and one of the chief instruments of the Persian classical tradition. Santoor featured in a 2008 St Ives September Festival recital of North Indian music. Though now a popular instrument in North India, it originated in Persia. I've spoken to promoter Will Sleath and there are still some tickets available - £12.00. Will Sleath 01736 794 477. St Ives Tourist Information 01736 796 297. A big thank you to everybody who came to visit my garden (and the other secret gardens in St Ives) over the weekend. I didn't keep an exact count but I reckon that I had more than 150 visitors over Saturday and Sunday. I also enjoyed all the chats I had with people and the nice comments. Good to meet some of my blog readers as well. If you want to come back to see how things are progressing over the seasons you are welcome - just get in touch. The same applies if you were unable to make it over the weekend. 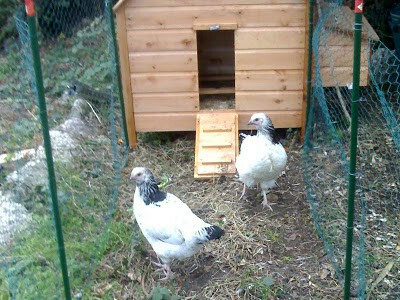 Bring a treat for the chickens if you want (sardines. cooked rice, bread, biscuits). A big thank you to Colin Sanger (who took the photo above) for organising the event. I'm looking forward to participating again next year. I came across an interesting blog post this weekend. 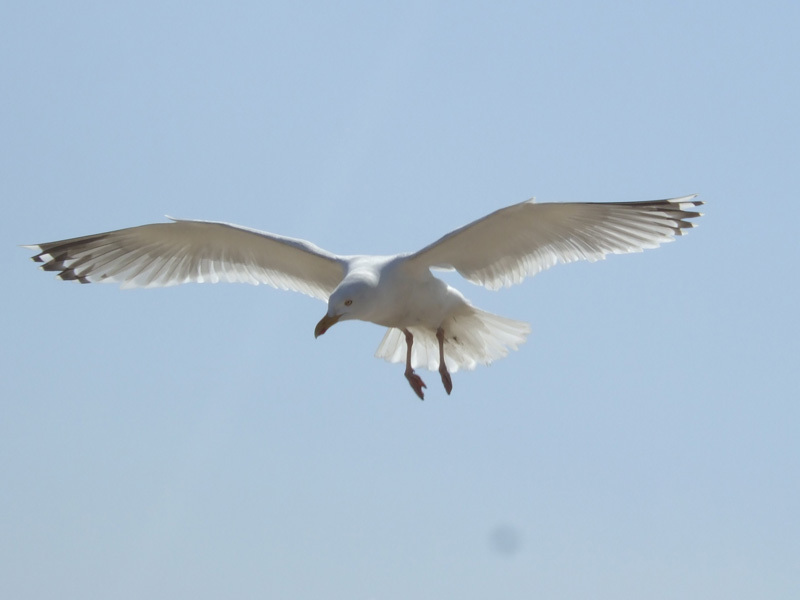 Local blogger Colin Matthews was told that putting a dead seagull on his roof would get rid of the gulls. He came across one, put it on his roof and reckons that it works ! I'm not sure that I fancy trying that - but check out the link above if you want to give it a try. Any other ideas let me know. No seagulls were harmed in the posting of this blog. Looks like a sunny week ahead in St Ives and as ever lots going on. Tomorrow (12th) sees the long awaited launch of the St Ives Jumbo - the second in the revival of a class of racing fishing boats, last sailed in the 1800s. The Slipway 2.30 - more details in a previous post. This coincides with the St Ives Sailing Club Regatta in the bay. 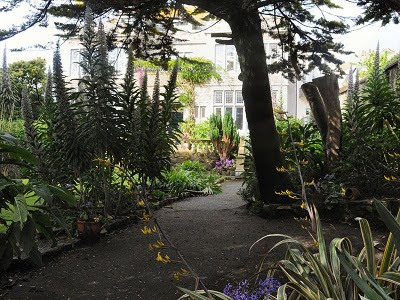 Tomorrow (12th) and on Sunday (13th) several private gardens in town are open as part of Secret Gardens Of St Ives, 11.00 am to 4.00 pm. Programmes for entry to all gardens will be available from St Ives Parish Church. Monday (14th) is the first day of the St Ives Food and Drink Festival, starting with a free Cornish Cheese and Wine tasting at The Cornish Deli, 3.00 pm to 5.00 pm. More events throughout the week - details on the Food and Drink Festival Website. On Tuesday (15th) St Ives Jazz Club features Georgia Mancio Quartet at The Western. Doors open at 8.00 pm, first of two sets starts 9.00 pm, entry on the door is £10.00 / £6.00 (members). Wednesday (16th) sees a new production of Soggy The Bear - childrens theatre for ages 3 to 8. At St Ives Theatre with performances at 10.30 am and 12.00 pm, tickets £5.00 available from the theatre box office. Further performances on Thursday and Friday, then throughout the summer. On Thursday (17th) St Ives Farmers Market is open at The Backpackers from 9.30 am to 2.00 pm - with the usual great selection of local produce. 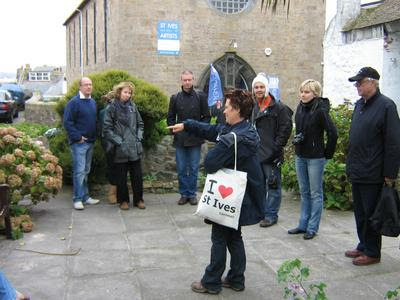 On Friday (18th) check out St Ives Now and Then - a guided tour of the town with Valerie Hurry. Featuring history and quirky facts about St Ives. Meet outside Tourist Information Centre, no need to book - just turn up. Cost is £5.00 per person. Valerie will be running these tours throughout the summer every Monday and Friday. She also runs an art tour - St Ives in the Frame - every Thursday. This Saturday (12th June) St Ives Jumbo Association will be launching their second ‘jumbo’. Timed to coincide with Regatta Day, it will mark the culmination of 2 years of fundraising and, most significantly, the launch of the Jumbo Class – a new racing class of Victorian fishing boats that were unique to St.Ives. “Racing Jumbos will be a dynamic means of celebrating the town’s heritage that we hope will encourage younger people in particular to engage with the sea and each other whilst developing self-esteem and a sense of pride in the community.” says Jonny Nance, spokesman for the Association. A launch, always a big event in any community, will be a celebration of old St.Ives. During the ceremony, which begins at 2.30pm at the old slipway by The Sloop Inn, the new boat will be named ‘William Paynter’ as a tribute to the renowned St.Ives boatbuilder who designed today’s reincarnation back in the mid 1880’s. The event will include contributions from St.Ives born Janette Eathorne and Mick Paynter (the Grand Bard of the Cornish Gorseth and descendant of William Paynter) and conclude with the customary saffron buns and ‘a dish o’ tay’. The ‘William Paynter’ is expected to be afloat by 5.00 pm when, together with her sister ’Celeste’, she will sail out to into the bay to join the pilchard lugger Dolly Pentreath. 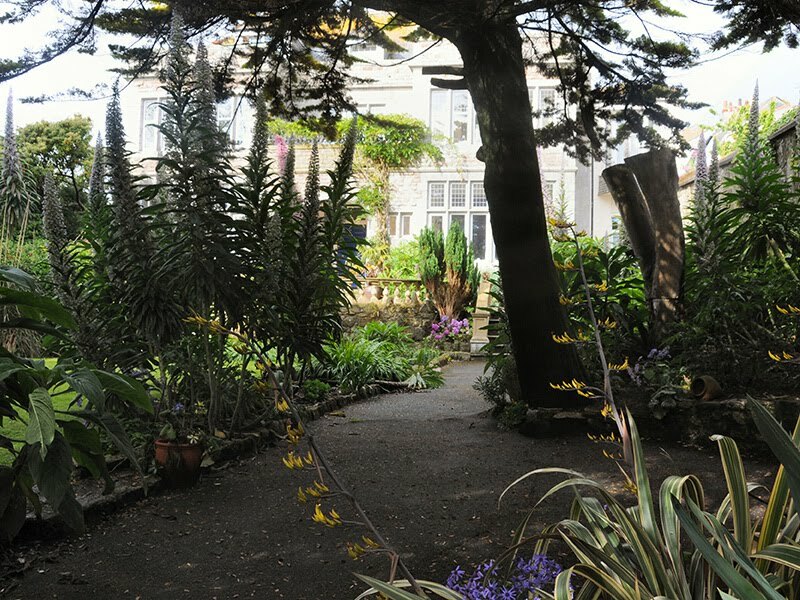 This weekend - Saturday (12th June) and Sunday (13th June) several private gardens in St Ives will be open to the public from 11.00 am to 4.00 pm. This is a fundraiser for St Ives Parish Church - currently celebrating its 600th anniversary. Brochures (which are also entry tickets) will be available from the church each day costing £3.50. These give an ‘at a glance guide' to the locations around town. 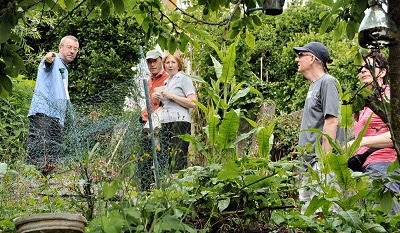 The vicarage garden off St Andrews Street is included - a wild oasis of rare perennials where visitors can enjoy a cream tea on the lawn. Also an organic garden of leafy , free-flowing shrubs, flowers and trees. Trewyn House is included plus several more. Tate St Ives is participating the fundraising by allowing visitors to enjoy Barbara Hepworth’s Sculpture Garden at half the normal admission fee - £2.75 (concessions £1.75). My own garden in Bedford Road is also included for the first time. Mostly dedicated to growing fruit and vegetables, but also with flower and wild garden areas. 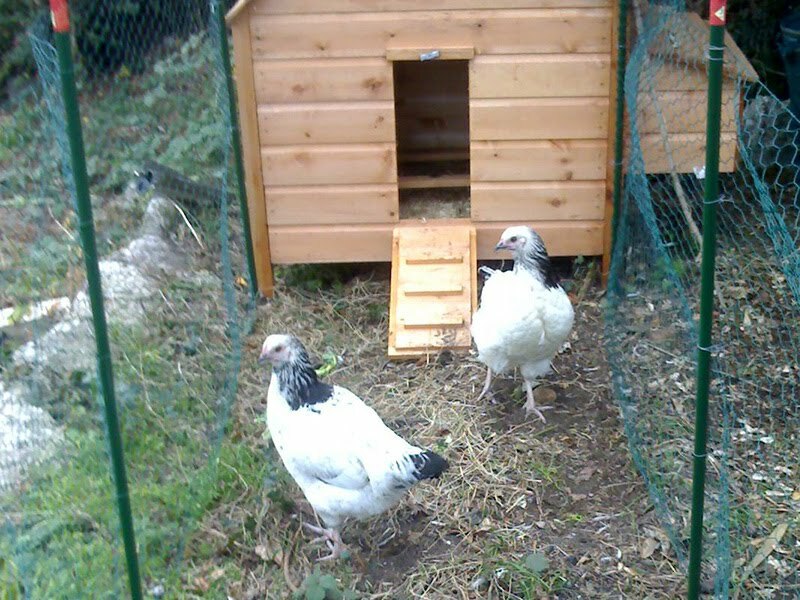 So please do come along - and you can also meet the chickens ! My wife Jo has just scheduled more of her popular textile art workshops for adults in St Ives - running through to September. These include Knitting With Wire, Feltmaking, Bookmaking, Weaving, Silk Painting, Applique, Silk Paper and Tie-Dyeing. Each runs from 10.00 am to 4.00 pm, so you get a full day. Cost is £40.00 per person including all materials. Jo also offers one-to-one tuition and workshops for groups. She will be running a series of workshops for children at St Ives Library during August - Suncatchers, Star Wrapping Paper, Twinkling Twirlers and Galactic Mobiles. Please contact the library to book a place - advance booking is advised as these are popular and numbers are limited. Cost is £2.00 per child. You can call in at the library on Gabriel Street or contact them by phone on 0300 1234 111. 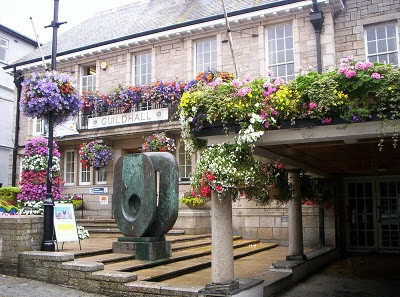 The annual Cornwall CAMRA St Ives Beer Festival opens tomorrow at The Guildhall - one of my favourite events of the year. Open from 11.00 am to 11.00 pm on Friday (4th) and Saturday(5th). Also live music on Friday evening and throughout the day on Saturday. The line up includes Gallowglass, Keltz, St Ives Kruners, No Strings and Jonah's Lift. Pub games, food, free soft drinks for designated drivers. Entry is £2.00 (CAMRA members), £3.50 (non-members). This includes a souvenir festival glass and a programme. Well worth a visit.